A successful career is only possible when a person is said to be physically fit. And to be fully efficient in worklife you need to be conscious about certain health habits which will prevent you being sick at work. Getting ill at work will not only affect you physically but it will make you mentally stressed about not able to perform well at office. It is very common to catch infectious germs from working environment as it is a place where thousands of people meet and mingle at a same place. Read this post completely to know how to help yourself. Here are the few health tips which will save your health at workplace. According to recent health survey, most of germs spread and cause infection from unclean hands. So, it is very essential to keep your hands clean and free from germs. Wash your hands often with a mild hand wash and pat it with a dry towel. And it is also better to use a hand dryer to avoid germs spreading from hand towel. When in case you do not have an option of washing hands often use a hand sanitizer to avoid infectious germs spreading all over. Make sure, you do not use hand sanitizer or a hand wash which has strong fragrance as it involves lots of chemicals in it. Face is the only area which gets exposed directly to cold catching flu’s or bacteria. Do not rub your face often or do not bite your nails which gets directly in contact with nose. This might cause germs spread to your nose or mouth as most of the bacteria’s gets a home under your nails. So, make sure you avoid touching your face often. And very importantly do not bite your nails as surely it will make you infected with bacteria. If it has become a habit of biting, it is better to consult a doctor to avoid such bad habits. It is unavoidable to face people who have been affected by cold or any other contagious flu’s. So, there are few tips to help you not get infected from those people. The very first step is try to catch your breath for few seconds just as to prevent getting sick by being affected by contagious flu’s. If you are a person who does not know how contagious it is, when an infected person sneezes or coughs the germs spread rapidly in air around few seconds. So just be conscious to help yourself stay away from those kind of situations. There is a common misconception that vaccination is only meant for kids. But in reality you should know how to prevent yourself from catching flu, and infectious bacteria in air. 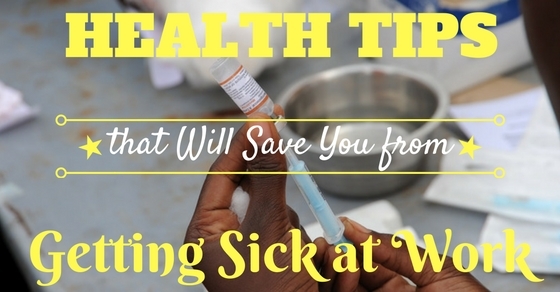 A proper vaccination will help you fight against getting sick, illness, and also from diseases for a good period of time. Try to consult a doctor to inject yourself with influenza vaccine which is the most common vaccination for all age group to avoid getting infected by viruses and bacteria. Whenever you feel sick or not up to your health try staying at home. This will help you take home remedies as well it will help you not catching infection from others as your immunity tends to be weak when you are not feeling well. You can also try keeping yourself warm by using humidifiers, and air purifiers in home, keep yourself comfortable and quick recovery from illness. There are numerous benefits of drinking warm water. Especially when you are sick, it is very good to take hot water because when the water is boiled to a certain level there are more chances of killing bacteria in water which will help you to some extent when you are sick. And in general too, drinking hot water in office is equally beneficial to prevent getting sick. Being a healthy and active person both at home and work does not come in a day. It requires lots of effort and strict diet discipline to keep yourself staying away from getting sick. Follow traditional and old health habits to keep yourself healthy. That too early morning healthy habits gives more benefits than the other diet routine. For example you can start your day with a warm lemon water, thirty minutes’ walk, any kind of sport practice will keep your body fit as well as help you increase your immunity level. Naturally nowadays most of the office environments are being fully air conditioned except few of them. Even though it is unavoidable to stay in air-conditioned room you can follow few tips to stay away from tightly packed office environment. Try taking small breaks and step out for few minutes to get fresh air during work. Being outdoor and experiencing fresh air has innumerable benefits like it rejoices your mood, a fresh feel from staying out of your desk and the natural view will give you a better health as well fresh mood to work better. That too on a sick day, getting fresh air will make feel less suffocated. A proper night’s sleep is very essential for over all well-being. And it helps you prevent from getting tired or feeling sick at work. Your body and your mind will respond only when you have a good night’s sleep for at least 7-8 hours. Hence, follow a proper routine for good sleep to keep diseases at bay and will make you feel energetic at work. Always try to keep yourself updated about the health issues around your place or even in your locality. There are many chances of common flu spreading around like dengue or any kind of contagious diseases around. So, always try to take timely medical vaccinations or common prevention techniques to avoid catching diseases. Staying away from sick people at a distance might not be sounding good. But you need to more majestic to not show that you are moving away but at the same time try not being in close contact. If you are in position give them a leave, try giving them a break or just try avoid getting close in contact with them. Until and unless it is necessary, do not travel outdoor. This is because of the polluted air due to traffic. All of us have to generally travel for some part of the day to reach office or their working environment. Polluted air is very harmful as well it has more polluted components and once when we breathe it more in a day, there are chances getting health issues. There is nothing more dangerous like air pollutants which directly affects the lungs when exposed for a long time. So try to avoid traveling a lot during peak hours and if it is unavoidable use face masks to avoid pollution. Germs or few bacteria mostly exist on frequently used spots like doors, hand railings, desks, and on phones etc. So, try to keep your surroundings clean by using disinfectants, or fragrance free soaps to clean your place. Use a clean towel to clean your place before you leave or when you enter your work area in the morning. Most of flu dwells in often used common places by many people. Keeping it clean will prevent you from catching diseases and also prevent getting sick. Above all tips of staying healthy, one most important tip is to listen to your body. Never over indulge or keep your body under nourished. And try listening to your body and then proceed your day. For example, there might be times your body does not respond to indulge in eating heavy foods or sometimes it does not respond for working long hours. So, always listen to your body and then do whatever you need to do in your day to day routine. For employees who are unable to use water, or soap due to their work scenario can make use of sanitizers. These alcohol based sanitizers can kill germs and cold. The true fact is that stuffy organizations do not permit air to be circulated. When the organization’s doors are shut the workers are to share the air inside which is the main reason for getting sick quickly. It is hence important to open the windows once a while so that fresh air gets in. If in case there aren’t any windows, then employees can walk for a while outside, as it avoids them getting sick. For employees who have a sore throat, ice chips can be utilized which can relieve them with pain and soreness. The other main advantage of having ice chips is that they keep your body hydrated. Cold and cough can attack employees any time at work and hence having precautionary medications with them is necessary. Throat spray, cold drops and cough suppressants are few necessary items to have in advance. A sore throat can be soothed and numbed with these items. Cough suppressant is one which keeps coughing away. Nose, lungs and throat are affected mainly due to smoking and second hand smoking as they are not fresh air which is circulated. A number of serious health related issues can be avoided by quitting smoking. Sip juice, water and other clear liquids often throughout the day. When an individual is hydrated then the immune system battles sickness easily. The other main advantage of being hydrated is the mucus is loosened and fluids that are blown from the nose are replaced. It is always advisable that there is always a healthy supply of drinks on the employees desk, so that they are hydrated. It is good to skip black coffee and switch over to green tea. It is found out that the magic ingredient catechin named as epigallocatechin gallate (EGCG) have the capability to destruct the virus particles called influenza and avert them from entering into the system. This was published by German studies. The scientist has also found out that they may affect the Pneumonia causing bacteria and hence it is good for employees to have green tea often. Swallowing ginger can be the next best tip to keep away from sickness or never get sick. Taiwan researchers found that fresh ginger can inhibit respiratory syncytial virus that are in virus and avoids them being replicated. Severe cases of syncytial virus are pneumonia. It is hence good to grate some ginger in spicy tea or in your food. University of Wisconsin researchers at Madison have found that people who did meditation took about 76% fewer sick leave when compared to others. With the help of meditation, an individual learns to be focused and calm so that stress is relieved. Hence employees can start with meditation to stay calm and relaxed. This can be one of the secrets of people who never get sick. Healthy body is a dwelling place for peaceful soul. Keeping yourself healthy is very important not only for you, but it keeps your reputation high by being productive. Never stress your body when you are ill without taking any remedies. It is very common catching infections around your work place. So, always try to be cautious, and follow certain health tips to avoid getting sick at work. Hope this post helps you to prevent getting sick and also few remedies if it is unavoidable at work.